Summary and Definition: The Waco Siege (February 28, 1993 to April 19,1993) was a fifty-one day siege involving the Texas cult of Branch Davidians led by David Koresh and the American Federal and Texas state law enforcement agencies and the US military. The Waco cult was suspected of weapons violations which led to a search and arrest warrant by the Bureau of Alcohol, Tobacco, Firearms and Explosives (ATF) that sparked the incident. Four ATF agents and six Branch Davidians were killed in an initial raid when the FBI launched an assault on the Mount Carmel Center ranch just outside Waco Texas. Seventy-six people inside the compound, including David Koresh, were killed on April 19, 1993 when the compound became engulfed in fire and the Waco siege ended in tragedy. 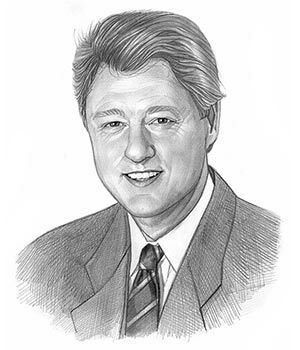 Bill Clinton was the 42nd American President who served in office from January 20, 1993 to January 20, 2001. One of the important events during his presidency was the Waco Siege involving the Texas cult of Branch Davidians led by David Koresh. The following fact sheet contains interesting facts and information on the Waco Siege, involving the Texas cult of Branch Davidians led by David Koresh. Waco Siege Facts - 1: The Waco siege involved a religious sect consisting of nearly 100 men, women and children, known as Branch Davidians, and were led by a man called David Koresh. Waco Siege Facts - 2: The Branch Davidians religious cult was established in 1935 by Victor Houteff, a self-proclaimed messenger of God, and had settled 10 miles outside of Waco, Texas. Victor Houteff's goal was to "bring about a reformation among God’s people". Waco Siege Facts - 3: David Koresh was born Vernon Wayne Howell in Houston, Texas in 1959. He arrived at the Branch Davidian compound in 1981 after being disfellowshipped from a Seventh-day Adventist church in Tyler, Texas. Waco Siege Facts - 4: In 1987 David Koresh and his followers were involved in a gun battle with George Roden, the then-leader of the Branch Davidian sect. George Roden was imprisoned but the others were acquitted of all charges, but the name of David Koresh had attracted the attention of the authorities. Waco Siege Facts - 5: David Koresh became the leader of the Branch Davidians. He had legally changed his name because he believed that he was now the head of the biblical House of David. Koresh was the name of the Persian king who allowed the Jews held captive in Babylon to return to Israel. Waco Siege Facts - 6: The Branch Davidians religious cult had an obsession with prophecy and David Koresh convinced his followers that he was the only one who could interpret the prophetic passages of the Bible. The Branch Davidians believed that David Koresh was the 'Lamb of Revelation' and the Son of God. Waco Siege Facts - 7: The Branch Davidians cult, led by David Koresh, were located in a 77-acre ranch with several buildings at the Mount Carmel complex near Waco, Texas. Waco Siege Facts - 8: Rumors circulated about the activities of the Branch Davidians sect. Ex-members of the cult made various allegations of its activities including those of child abuse, beatings, intimidation, isolation, food deprivation and sleep deprivation of disobedient members who disagreed with David Koresh. Outside family ties of members were cut. Waco Siege Facts - 9: All females in the Waco commune belonged to David Koresh, including all married women and some of his “wives” were as young as 12 years old. Waco Siege Facts - 10: On June 4, 1992 the Bureau of Alcohol, Tobacco, and Firearms (ATF) opened an investigation of the Branch Davidians, after receiving a tip about the possible manufacture of illegal firearms. The ATF begins a plan to search Mount Carmel and arrest David Koresh. Waco Siege Facts - 11: On February 25, 1993 ATF agents obtain a search warrant for the Mount Carmel complex and an arrest warrant for David Koresh. They then rehearse a raid on the Branch Davidians compound. Waco Siege Facts - 12: On February 28, 1993 the ATF tries to storm the Mount Carmel complex. At about 9 a.m., ATF agents arrive in National Guard helicopters and circle the compound in an attempt to divert the attention of the Branch Davidians. Waco Siege Facts - 13: Trucks and trailers with over 70 heavily armed ATF agents then pulled into the Mount Carmel driveway. Shots are fired and an hour long gun battle begins. Waco Siege Facts - 14: During the devastating gun battle four ATF agents are killed and 20 others are wounded. Six Branch Davidians are killed and 5 other cult members are wounded. Waco Siege Facts - 15: A ceasefire is negotiated and the Branch Davidians agree to hold their fire in return for the ATF’s promise to leave the property. Waco Siege Facts - 16: The Mount Carmel complex remains surrounded and the standoff known as the Waco Siege begins and will continue for a total of fifty-one days from February 28, 1993 to April 19,1993. The following fact sheet continues with facts about the Waco Siege, involving the Texas cult of Branch Davidians led by David Koresh. Waco Siege Facts - 17: On March 1, 1993 the ATF (Department of the Treasury) relinquishes jurisdiction of the Waco Siege to the Department of Justice and to the FBI. By this time the Waco Siege has attracted massive media attention and the press join the throng of government agents. Waco Siege Facts - 19: By March 9, 1993 twenty-three Branch Davidians left the Mount Carmel compound. The adults were immediately arrested and imprisoned and the children were placed in the care of Texas authorities or relatives. Waco Siege Facts - 20: On April 19, 1993, after fifty-one days of negotiations, the decision was made by Attorney General Janet Reno and the FBI to flush David Koresh and the Branch Davidians out of Mount Carmel and end the Waco Siege and the possibility of a mass suicide. Waco Siege Facts - 21: The breaking of the Waco Siege began as tanks, with massive booms able to spray CS Gas (tear gas), smashed through the walls of the complex spraying CS Gas inside. Then grenade launchers were used. The Branch Davidians returned fire but none would give themselves up and leave the compound. Waco Siege Facts - 22: At about 12.00pm a fire starts and the Mount Carmel is soon in flames. Fire trucks were not allowed to approach the building due to the risk of hostile gun fire. Only nine people left the building during the fire. Waco Siege Facts - 23: The Waco Siege ended in disaster and tragedy as seventy-six Branch Davidians died in the compound fire, including twenty-seven children. Most of the deaths were caused from smoke inhalation, but at least 20 Branch Davidians, including David Koresh, also died of gunshot wounds. Waco Siege Facts - 24: Many aspects of the Waco raid were highly criticized and Congress was misled about the Waco operation. After the Waco siege On April 20, 1993 President Bill Clinton stated that Janet Reno should not be pressured to resign because religious fanatics had committed suicide. Waco Siege Facts - 25: About 100 survivors and relatives of the people who had died during the Waco Siege filed suit against the federal government for $675 million, alleging that agents had used excessive force to end the siege. Waco Siege Facts - 26: Senator John C. Danforth released a report concluding that although federal agents had mishandled evidence, they had neither started the fire nor improperly employed force. Further investigations showed that the fire was purposely set by the Branch Davidians themselves. Waco Siege Facts - 27: Eleven Branch Davidian survivors stood trial and were given harsh sentences for their involvement in the Waco Siege, some of which were subsequently reduced. Waco Siege Facts - 28: The Waco Siege resulted in the largest loss of life in law enforcement operations in modern American history. Waco Siege Facts - 29: The Waco Siege was later cited by American anarchists Timothy McVeigh and Terry Nichols as one of the reasons for their devastating act of revenge in the 1995 Oklahoma City Bombing. The article on the Waco Siege provides detailed facts and a summary of one of the important events during his presidential term in office. The following Bill Clinton video will give you additional important facts and dates about the political events experienced by the 42nd American President whose presidency spanned from January 20, 1993 to January 20, 2001.